Versadock Fender: Available in White or Blue. The fender is connected to the outside edge of the dock using the standard pin and nut. Made from polypropylene, it is tough and durable. Versadock Cleats: Our standard cleats are made from galvanised mild steel or Aluminium. The Versadock lightweight cleat is suitable for dinghies, and the heavy duty cleat is used for mooring larger vessels alongside. Versadock Stanchions & Bases: The standard stanchion incoporates a third dimension to eliminate any flex outward should the stanchion be leant on. They are made from galvanised mild steel, and come with either external rings or internal holes to thread rope or wire. The stanchions are seperate from either the corner base or the standard base. This allows the stanchions to be placed anywhere on the dock and in any configuration. Dock Connector: Available in Galvanised mild steel, the Versadock dock connectors are available in 600mm (2ft) and 900mm(3ft). 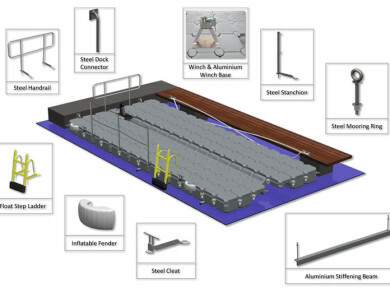 They connect to existing pontoons or walls, and drop through the external tabs, this allows the floats to be securely attached, but free to move up and down.